The Robb Report rated Buckhead one of the USA's 10 "Top Affluent Communities" for "some of the most beautiful mansions, best shopping and finest restaurants in the southeastern United States." Buckhead is one of the "nation's best subcities," according to a report on America's top cities. "Emerging Trends in Real Estate" (sponsored by Lend Lease Real Estate Investments and PricewaterhouseCoopers) compared the area's vibrant residential-commercial mix and 24-hour flavor to San Francisco, New York and Boston. "Buckhead, where affluence, prosperity and entertainment commingle, is one of Atlanta's most attractive business areas. Atlanta ranked No. 1 among U.S. metropolitan areas as the best place for women and minorities to climb the business ladder, according to Demographics Daily's business-diversity index. The Buckhead Coalition's Buckhead Guidebook is on the news stands, or you can order it. For details, click here. Bid from your heart: CauseLink.com lets you support your favorite charity by participating in online auctions. The site was created in 1999 by a group of Buckhead residents and now helps hundreds of nonprofit organizations across the nation raise funds. BATMA (Buckhead Area Transportation Management Association) sells discounted monthly MARTA passes to residents and employees in Buckhead, it also offers carpool and vanpool matching services. Call 404-842-2680 for details. The Buckhead Community Improvement District (CID) is working to redesign the Peachtree Road corridor through Buckhead to improve the pedestrian environment, create better access to transit and improve traffic flow. 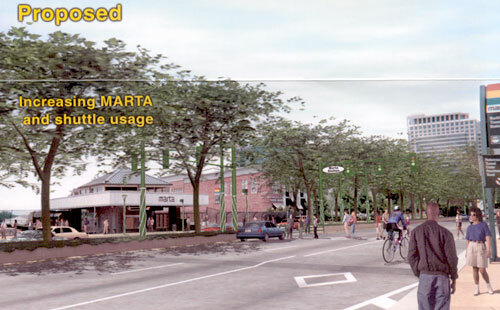 The image above, courtesy of the Buckhead CID, shows a proposed redesign of the Buckhead MARTA station. 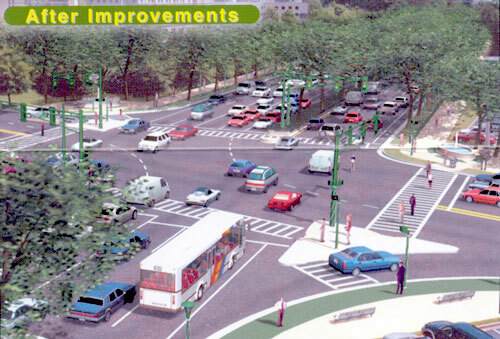 The image at left, also courtesy of the CID, shows the proposed greening of Peachtree . A joint venture between the Atlanta Convention & Visitors Bureau and MARTA could bring a tourist trolley to Buckhead. The official title is the Atlanta Attraction Transportation Link, or ATL for short. Several routes are being planned to circulate tourists throughout the city. One route might originate from the the Lenox MARTA station and take tourists to the Atlanta History Center and Buckhead Village. The system will feature natural gas-powered trolley buses, each able to carry 28 passengers. The buses will run seven days a week from 10 a.m. to 6 p.m. The revived Buckhead Village Merchants Association is working to improve the Village's image. Members are targeting litter, working with police to control traffic and debating beautification proposals. To celebrate its 70th anniversary, Harry Norman, Realtors, has published "An Anniversary Celebration of Seventy Homes" featuring some of Atlanta's most beautiful houses. Text is by Atlanta historian William R. Mitchell Jr. The book is available at H. Stockton and B.D. Jeffries locations, or by calling (404) 705-6954, ext. 5120. Proceeds will benefit the Atlanta Botanical Garden and the Southern Architecture Foundation. Twenty emergency 911 telephone call boxes are located throughout Buckhead's main business district. The units operate 24 hours a day and provide direct links to police, fire and medical assistance. They are easily identifiable by their bright yellow covers and fluorescent blue signs. They automatically register the caller's location. Land use experts imagine a pedestrian-friendly Buckhead in a new planning guide. The "Case of the Missing Bride," Mary Shotwell Little's disappearance in 1965 catches fire again in a new Atlanta Journal-Constitution article that opens old FBI files and cites previously undisclosed witnesses in Buckhead's most enduring mystery. Also see Buckhead.net's 1965 account from "The Detective Who Never Forgot" and photos. Councilwoman Clair Muller has proposed building a two-lane parkway through Bobby Jones Golf Course connecting Northside Drive and Peachtree Road to relieve neighborhood streets of crosstown traffic. The golf course would be redesigned and reduced to nine holes or eliminated. Some private property also might have to be acquired for the road, which would parallel Collier Road on the north and connect with Peachtree near the Brookwood Square shopping center. The Colonial Homes apartments also might be impacted. Swan House, the Philip Schutze-designed architectural gem at the Atlanta History Center has reopened after a $5.45 million restoration. Rooms previously closed are now open. Take the Buckhead shuttle: The Buc, the new free Buckhead shuttle bus service, connects MARTA's Lenox and Buckhead stations to hotels, office buildings, shops, restaurants, Phipps Plaza and Lenox Square. The name is an acronym for Buckhead's Uptown Connection. The shuttle runs every 8-15 minutes between 7 a.m. and 10 p.m. Monday through Friday on a five-mile loop. Architectural historian William Mitchell has published a collector's reprint of the 1931 "Southern Architecture Illustrated," featuring some of Atlanta's most famous homes. For information, contact the Southern Architecture Foundation at 404-733-6565. Atlanta Police Zone 2 headquarters is now at 3620 Maple Drive, closer to the heart of Buckhead. The city no longer will pick up bulk trash left at the curb unless you call 404-330-6333 to schedule a pickup. The Peachtree Corridor Project is changing Peachtree Road through the heart of Buckhead. For a look into the future, click on each the photos above and visit BATMA's Web site. In addition, a larger safety improvement program aims to make 23 Buckhead intersections safer for pedestrians. The program is being funded by a federal safety grant and matching funds raised by the Buckhead Community Improvement District. Quality of life matters: Two Buckhead groups are putting their dollars behind efforts to make our district cleaner and greener. BATMA is offering $20 worth of gas a month to carpoolers. For details, click here. And the Buckhead Coalition is offering to help businesses and residents pay the cost of planting trees on private property. Call 404-233-2228, fax 404-812-8222 or write the coalition at 3340 Peachtree Road, Suite 560, Atlanta, GA 30326. Susan Barnard's "Buckhead: A Place for All Time" takes you into the insider's Buckhead. History, mystery, architecture, art, people, and places -- no one's ever covered it better. To order, click here. Planning an event in Buckhead? Click here for event sites and catering. The Atlanta Business Chronicle takes you on a 'Peachtree Road Odyssey'. For a look at experts' predictions on development trends, click here. "The Swan House" A new novel by Buckhead native Elizabeth Musser has one of the area's best-loved landmarks as its backdrop. Visiting the Village? An Atlanta city ordinance prohibits anyone under 21 years old from entering a bar. "The Swan's Palette," a new cookbook, celebrates Atlanta's taste traditions. It's available from the Swan Coach House Gift Shop (404-252-6497) and at Barnes & Noble at 2900 Peachtree Road. $21.95. Fred Brown and Sherri M.L. Smith offer an intriguing look at a storied river that forms one of Buckhead's borders in "The Riverkeeper's Guide to the Chattahoochee." Details.